24 Pokies Casino is One of Australia’s Newest Online Casinos. 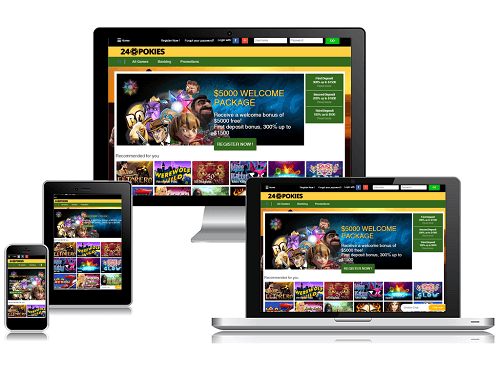 24 Pokies Casino was recently launched in 2017 and has already amassed a strong following of online Aussie casino players. 24 Pokies has a fast-growing reputation as having one of the widest selections of online pokies to choose from. These pokies are provided by some of the casino industry’s leading software providers. It has been a long time since we last got this excited about a new casino, so we sent in our experts to see what all the fuss is about. First Deposit: 300% match bonus on your deposit up to a maximum of $1500. Second Deposit: 200% match bonus on your deposit up to a maximum of $1000. Third to Seventh Deposit: 100% match bonus on your deposit up to a maximum of $500. That brings the potential bonus up to an amazing total of $5000. You won’t find many welcome bonuses like this online. Players are encouraged to keep in mind that there are wagering requirements involved before the bonus is activated. The deposits listed require 50x the deposit amount in wagers in order to be cashed in. Players should read the terms and conditions closely regarding the bonus structure, so there are no surprises. 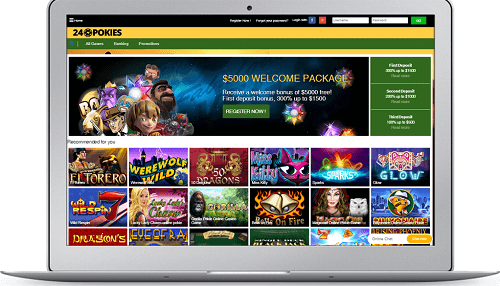 24 Pokies has managed to partner with an impressive list of software providers which has enabled it to open its doors with over 600 online pokies titles. This is truly impressive for a new online casino to amass such a large pokies library. The partnered software providers provide a diverse array of pokies online and include the likes of NetEnt, Playtech, Novomatic, Amatic, Aristocrat and Igrosoft. The website offers a slick user interface and search tool, so you will be able to quickly find any online pokies you are looking for. With the different software providers, there is a great selection of 3-reel and 5-reel online slots. With a name like 24 Pokies and over 600 of the best pokies titles to choose from, it clearly looks like this casino is set on targeting pokies players. This is great news for pokies players. However, the disappointing news is the casino offers no traditional casino table games. One further aspect we did appreciate about 24 Pokies, is that all of their games can be easily played on their mobile platform. Full support is provided for Android, iOS and Windows devices. Players are encouraged to read the banking terms and conditions, so they know what the withdrawal times are and if any banking methods have deposit charges. Generally speaking, the quickest withdrawal methods are usually e-wallets. As with all of the top online casinos, 24 Pokies offers full 24/7 customer support. Players can contact the support centre by live-chat, email or contact forms. We found the support staff friendly and efficient at handling our few test queries. Unfortunately, the casino does not have a full FAQ section as yet, which we find usually helps players. 24 Pokies is fully licensed and accredited, meaning players are guaranteed a fair and safe online gaming experience.The casino is audited by third parties to ensure it is fair to all players. in addition, this casino also features 128-bit SSL encryption software, which protects players personal information and data. Overall 24 Pokies is an impressive new online casino that targets Aussie players who love online pokies. We would have no issues giving this online casino the top rating possible if it provided a few casino table games for players who don’t always want to play pokies. As it stands, however, we give 24 Pokies a solid four out of five stars, which is high praise for a casino as young as this one!